Aircraft design is the key to successful economic and service life. Careful design of structure based on relevant stress and loads data ensures that a design will meet or exceed all performance objectives throughout the life of the aircraft. Maintaining required strength and rigidity, while adhering to weight and cost targets requires expert knowledge of material behavior and manufacturing and assembly techniques. 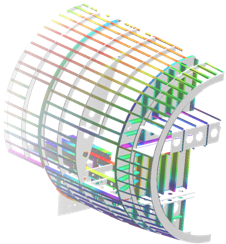 Aerosciences structural designers have proven experience working with all types of structure, through all phases of design. From layout to detailed design stages, primary or secondary structure, modifying existing structure or working from lofted surfaces, Aerosciences designers can work within given constraints to obtain the optimum solution to any designs. Other CAD software programs may also be utilized, if desired per client request.